Visit Butler Books to order a copy today! One of the primary educational missions of www.pre-pro.com is to collect information regarding the location and ownership of all distilleries operating in the US in the years prior to Prohibition. The results of this endeavor can be found in the www.pre-pro.com Distilleries Database, which currently lists around 3,000 distilleries operating in 35 states. Because distilleries were identified by unique registered distillery (RD) numbers issued by the government, compiling such a database would seem to be a relatively trivial task. The reality turned out to be an organizational nightmare. To begin with, RD#'s were not unique - they changed as the distilling and taxation landscaped changed. Distilleries, which were usually constructed of wood, produced a highly flammable product (i.e., alcohol) using open flames as a heat source, a frequently disastrous combination that caused plants to explode and burn on a regular basis. Distilleries also changed hands, moved locations, and were renamed on a regular basis. Compounding all these difficulties is the fact that records from the pre-Prohibition era are commonly sparse, incomplete, or missing entirely. Anyone attempting to trace the timeline of a distillery must necessarily have a serious obsessive compulsive disorder and a barrel-load of stamina and determination. The first serious attempt to catalog US distilleries came in the form of The Evolution of the Bourbon Whiskey Industry in Kentucky, by Sam Cecil (1999). Cecil's work focused on Kentucky, which has long been associated with fine bourbon and other distilled spirits. Sam Cecil spent most of his professional life in various Kentucky distilleries which afforded him an insiders knowledge of the industry. Cecil's book should be every collector's shelf, but the lengthy sections on individual distilleries were not well researched and, thus, are full of misleading or inaccurate information. The author himself recognized that his book represented a first step toward a more serious investigation of KY distilling history. That investigation, still ongoing, was undertaken by Chester (Chet) Zoeller. 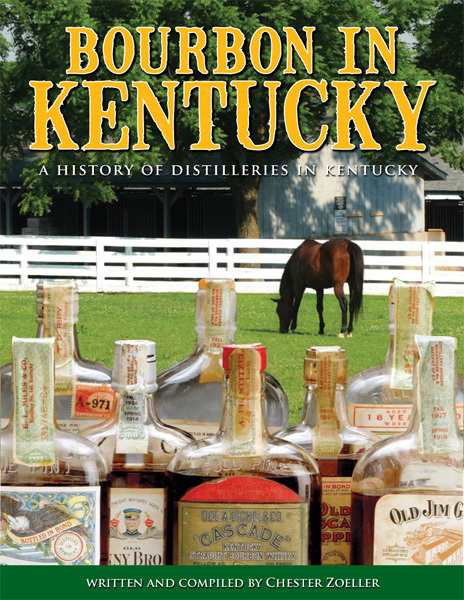 The results were first published in 2009 under the title of Bourbon in Kentucky: A history of distilleries in Kentucky. The first printing of 1,000 copies sold within a few months, so Chet updated the book and published the second edition in 2010, which is reviewed here. Bourbon in Kentucky has a very similar look and feel to Cecil's "Evolution": both are high-quality glossy productions amply illustrated with the requisite glasses of amber fluid, stacked barrels, gleaming copper stills, and black-and-white photographs of distillery buildings gleaned from historical societies. The similarities between the two books are largely superficial, however. At the intellectual and physical heart of Bourbon in Kentucky is 200+ page Catalog of distilleries in Kentucky. Inserted in front of this is a somewhat meandering description of the history of whiskey production in the US and the differences between bourbon and other ardent spirits. I have nothing but admiration for Chet given the amount of time and effort that must have gone into the production of this book, and it seems unfair to criticize his work based on 30-odd pages of background material that presumably were added solely to give the book shelf appeal, but potential buyers need to be aware that these sections suffer from something of a personality disorder before they swipe plastic to the tune of $39.95. The books begins with a guide on how to use the catalog, which has become strangely detached from its natural location 40 pages later. There then follows a chapter titled Bourbon and the community, which was taken verbatim (with permission) from Owensboro, The City on the Yellow Banks, by L A and A W Dew. This chapter is well-written and makes for a very interesting read, but it seems bizarre to pad one's own book with someone else's work however apropos and succinct it may be. The remaining chapters include a brief history of bourbon from its beginning until the present day, the differences between bourbon and other whiskies, how bourbon is made, and the reasons why Kentucky became a center for whiskey production in the US. These chapters cover familiar territory and are written in a distinctly different and occasionally folksy voice from that of the previous chapter. Chet's passion for bourbon and his home state are clearly evident, perhaps a little too strongly when he warns readers off Scotch whiskey with his assessment that it tastes of "...partial decay of plants in wet ground", a reference to the use of peat fires to dry the malted barley used in Scotch production. Many who enjoy Scotch whiskey consider comparing bourbon with Scotch to be akin to comparing Cool Aid with a fine Cabernet, but then it's all a matter of personal taste and experience. These chapters are preceded by a brief essay on How to drink whiskey, which is an excellent and considered inclusion. While no-one should be told how to enjoy their favorite beverage (e.g., water vs. no water, on the rocks vs. neat, or drowned in cola), it's good to be reminded that fine bourbon is a highly complex spirit whose varied olfactory and gustatory notes can best be appreciated by sipping and extending enjoyment of a single glass over the course of an entire evening. Well said, Mr. Zoeller. For those with a serious interest in Kentucky distillery history, the introductory chapters can be considered bonus material, because they will be buying the book for the "catalog". Those readers seeking a more thorough discussion of the history of alcohol production and use in US should look no further than Kentucky Bourbon: The Early Years of Whiskeymaking, by Henry G Crowgey, and "The Social History of Bourbon" by Gerald Carson. Both books are classics that have been recently reprinted and are readily available from the usual sources for $20 or less. The catalog is organized along similar lines to the Distillery database here at www.pre-pro.com. In the years following the civil war, Kentucky was divided by the Federal government into five numbered districts (#2 and #5 - #8) for the purpose of collecting taxes, and all operating distilleries within these districts were assigned RD numbers. The catalog is organized by district and then by county within each district. Distilleries are listed by name (or names), with dates of operation, capacity, location, and a brief history of ownership and significant events listed where known. A quick glance at the three-page reference list reveals that Chet painstakingly consulted numerous sources in order to ferret out the smaller stills, and the larger plants list with a well-researched history. This stands in stark contrast to Sam Cecil's book, where his catalog was based largely on the Coyte papers (referenced in HSG and OASG), whose contents are widely acknowledged to contain many inaccuracies. Since the catalog is intended as a research tool, it seemed only appropriate to use it as such before writing a review. The book references the Distillery database as a source of material so there is inevitable overlap, but most entries in the catalog are fleshed out with additional material and it also includes many distilleries not in the Database. Gratifyingly, I was able to use the catalog to to help untangle several anomalies that had crept into the Distillery database, and it was reassuring to hear a clear voice of authority in Chet's words. I think Chet would be the first to admit that even this second edition is still only the beginning of a long journey that can probably never be completed because, in pre-Prohibition days, anyone with land and surplus corn or other grain ran a still. Most stills were small and not worthy of note, but many larger still-houses stood and burned leaving little record other than a line in a letter to a friend. Entire books could be written about the famous plants. But "Bourbon in Kentucky" represents an important step along the way and a significant compilation of data that would make a worthy addition to the library of anyone interested in pre-Prohibition history, whether they be shot-glass, jug, or bottle collectors, or those who enjoy sipping a glass of any of Kentucky's fine bourbons. Copyright © 2012 pre-pro.com. All rights reserved.